Brunello Cucinelli jersey dress with signature monili beading at shoulders. Approx. 46.5"L down center back. Brunello Cucinelli dress, featuring mesh overlay with Swarovski?? crystal embellishment. Approx. 51"L down center back. Crew neckline; square neck illusion. Elie Tahari "Janine" lace cocktail dress with fringe trim and capelet. Crew neckline. Draped short sleeves. Fit-and-flare silhouette. Midi length. Elie Tahari "Janine" lace cocktail dress with fringe trim and capelet. Crew neckline. Draped short sleeves. Fit-and-flare silhouette. Midi length. Sheer flounce hem. Hidden back zip. Other fiber. Polyester/spandex lining. Dry clean. Imported. Johnny Was "Zakina" tiered dress in multi-print georgette with lattice insets. Split neckline with tassel ties. Short sleeves; scalloped edges. 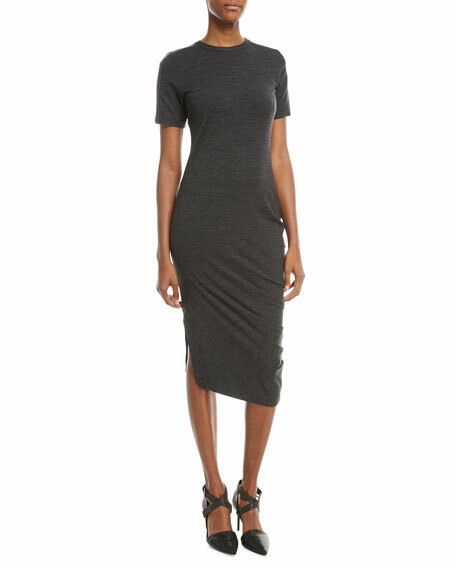 Lafayette 148 New York stretch-knit T-shirt dress. Approx. length: 38"L down center back. Round neckline. Short sleeves. Slim shift silhouette. 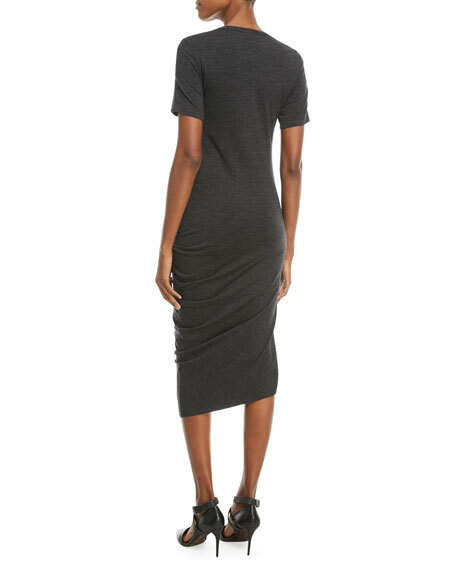 Lafayette 148 New York stretch-knit T-shirt dress. Approx. length: 38"L down center back. Round neckline. Short sleeves. Slim shift silhouette. Straight hem. Pullover style. Viscose/nylon/spandex. Dry clean. Imported of Italian material. Model's measurements: Height 5'10"/177cm, bust 33"/84cm, waist 25.6"/65.2cm, hips 35.8"/91cm, dress size US 2-4/FR 34-36.